We've been doing a fair bit of introspection lately, looking at the best PCs in PC games and showcasing 15 games with their own simulated operating systems. Which made us wonder: if videogames are a form of escapism, is it possible to escape within that form of escapism? Yes it is—by frequenting virtual pubs, obviously. 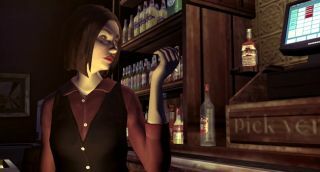 And before this all gets a bit too Inception, raise a glass to/drown your sorrows with our list of the best pubs in PC games. On tap: Suspicious brown ales, possibly watered down with festering dock water. Vibe: We’ll all be dead of plague soon so who cares if the bar snacks kill us first. The conspirators’ hangout in Dishonored is the perfect example of a pub that exists only for a select cadre of locals. A punter hoping for a quick pint on the way home from the docks will be met with cold stares and served with icy contempt. Most will leave partway through the first tankard, put off by the extremely dodgy brew and that really starey guy at the end of the bar who looks like he’s murdered a lot of people in mansions. Situated in the heart of Whiterun, The Bannered Mare is the quintessential medieval pub with its open fire centrepiece, exposed wooden joists, ornate wall-hung shields, and typically leary clientele. And yet it's the more reticent of patrons that make this free house so special, not least Sam Guevenne—a Breton mage who enjoys drinking competitions. Take him on and you wake up half the map away in Markarth with a headache and zero recollection of the previous evening. Vibe: The best and only hangout spot in the city. Of the four or five rooms that make up Dragon Age 2's Kirkwall, this is my favourite. The Hanged Man is basically the city's centre of activity, with jaunty music, semi-classy decor and a nice, relaxed atmosphere. It's also where Varric and Isabela hang out when they're not in your party, and they're pretty much the two best companions in the game, so I ended up spending quite a lot of time here. It's better than hanging out with Bodahn and Sandal in Hawke's fancy house, anyway. As a noir detective mystery, Discworld Noir needed a sad, empty space for its most maudlin characters to drown their sorrows—including its protagonist, the PI and recent werewolf, Lewton. Cafe Ankh is that bar. It's not happening, and it's not hip. Nothing about it suggests that it's a fun place to be. But that's why it's so good—it's a bar that perfectly captures the atmosphere of its story, vampire pianist and all. Over and above everything else, a good digital pub should fit the tone of its game, and Cafe Ankh is the Casablanca parody that Discworld Noir needed. This establishment’s psychic dampening effect makes it a fine retreat for Torment’s addled techno-wizards. While they take a break from hearing the tedious inner complaints of every citizen in the city they can treat themselves to a tasty glass of searing psychotropic gunk. Before you visit it’s worth noting that the Fifth Eye’s cocktails randomly destroy drinkers, which adds a certain frisson to Friday evening celebrations. Vibe: Use beer on face. repeat. Vibe: We’re all here for a fight, right? In spite of some of the fine establishments on this list, there are very few videogame pubs that actually make me think: Yeah, I could see myself drinking here. The Steinway Beer Garden from Grand Theft Auto 4 is, however, one of those pubs with its Irish music, flowing whisky, draught beer and suntrap outdoor seating area. This pseudo tourist video doesn't exactly sell it, nor does getting Nico knocked down outside while blind drunk as chum Patrick "Packie" McReary watches on more times than I care to admit, but the Steinway is my kind of drinking den. So what if 90 percent of the clientele soil themselves, fight with one another armed with pool queues, or drink themselves into lifeless stupors—it's the authenticity of it all that lends it charm, wouldn't you agree? It's not as clean as an Elven arse, and you're even attacked when you first approach—calling its name into question. Otherwise, though, The Friendly Arm is a perfectly pleasant place. It's distinct from the series' other watering holes in not being attached to a local town, thus not filled with the town's local characters and criminals. It's a stopgap on an adventurer's route, and so full of possibilities. The heart of the Midgar slums probably doesn't feature high on your ideal night out list, however there's a certain charm to Tifa's 7th Heaven. With a name coined by Crisis Core's Zack Fair many years ago, this old fashioned watering hole houses bare wood furnishings, simple leather barstools, a rear-projection television, neon signage and a jukebox. The gantry is packed with your favourite liquors and if you fancy a spot of pinball make use of the vintage table. Just don't don't mess with that switch to the left because Tifa's 7th Heaven is actually a front for a guerrilla terrorist organisation whose headquarters resides in the basement and that there button turns the pinball machine into a lift and acts as the only means of accessing the clandestine den. Got it? Good. Tucked away down a narrow street southwest of the Massachusetts State House and directly adjacent to the gazebo at Swan's Pond lies a seemingly innocuous pub named Prost Bar. My first visit was a fairly routine one—I'd nipped indoors in search of supplies while being pursued by a gang of hostile raiders. To my delight I found a stimpack and two baseball grenades in a desk drawer in the back office, before retracing my steps towards the entrance. And then it hit me: this is Cheers! Set in Boston, Fallout 4's Prost Bar is designed to model the Ted Danson-starring hit TV show that ran from the early '80s into the early '90s. Better yet, it's littered with subtle nods to series as, besides its layout, baseball posters adorn the walls in a doff of the cap to Danson's ex-baseball playing character Sam Malone; one of the now very much dead patrons wears a postal uniform in reference to the show's postman character Cliff Clavin; and 'prost' is the German translation of the 'cheers' drinking salutation.